We are back from an epic wahoo bite we encountered all by ourselves at Pickle Bank out of Grand Cayman working on a 64′ Viking called AEI. The 82 mile run was slow and steady at 20 knots on Tuesday but we got there and got on the troll at the bank targeting wahoo. We ended up getting a bite here and there from wahoos throughout the afternoon mixed in between a lot of barracudas. By the time in was dark we had 5 wahoo in the 30 pound range in the box that we caught on the weighted “down rods” with split tail mullet and black/red Ilanders with ballyhoo. We also had two sailfish bites that didn’t come tight, but it’s tricky to catch them on wahoo gear. The seas calmed down perfectly for us to drift thought the night but it was lifeless in the dark all night with no action. First light we got back on the troll and got right back to the edge in the blue 81 degree water on the northern end of the bank and it was wahoo mayhem. 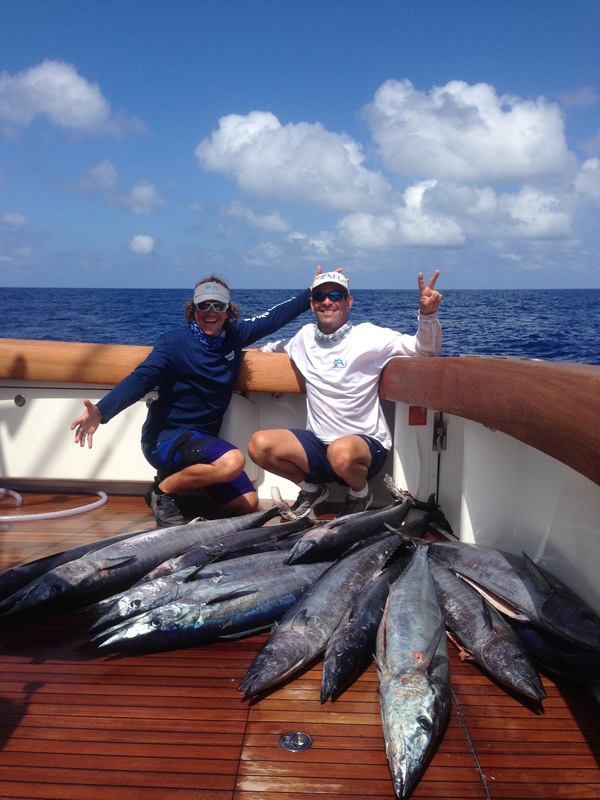 We landed 9 more wahoo and bait was showering everywhere from hound fish to flying fish and Bonita. We were completely satisfied with the amount of wahoo we had so we spent. The last couple of hours targeting billfish. Right away we had a small blue marlin come up on the right teaser squid chain with a mackerel chaser that just never successfully switched off to a hook bait. That concluded the awesome trip to the infamous Pickle Bank. We are hoping to get a few more days in here fishing around the island of Grand Cayman before I fly out on Monday. We are headed out early tomorrow to the infamous Pickle Bank 80 miles NE of Grand Cayman for an overnighter tomorrow. This will be this boats first big trip with its new owner Jeff, and after two days of prepping and rigging, we are stoked and ready to go catch whatever is swimming around out there in the Caribbean! Report to come Wednesday night..
Spencer and I arrived in Cayman yesterday and have been getting the boat ready to fish the next 5-6 days straight. The boat is a 64 Viking and it’s a new program. I was in FL with them in December and stocked the boat full of tackle so now we are getting everything rigged and ready. Looking forward to fishing a new location! Unfortunately our second leg in Grenada was cancelled the night before we were supposed to fly back, but everything always seems to work out. Spent a week at home then drove down to Fort Lauderdale with Joe Trainor to get “hell week” out of the way now getting the 54 Bertram Over Under up and running so she will be ready for the Bahamas. We had to do a lot of odds and ends, haul her out, etc etc to get her going, but overall she was in pretty good shape for a boat that has sat for 8 months. We actually turned the heat on last night on this boat for the first time. I never thought I would need heat in South Florida. Thank goodness it worked. I leave here today to fly back home to New Jersey and turn right back around tomorrow morning and get on a flight to Grand Cayman where I will be working on a 64 Viking for the week. Hopefully some good fishing action to come in Cayman! !